You've probably heard the saying, "business is never personal" or "don't take it personal, it's only business.” I know throughout my career working as CEO and publisher of Hope for Women Magazine, this phrase, I can say have heard hundreds of times. 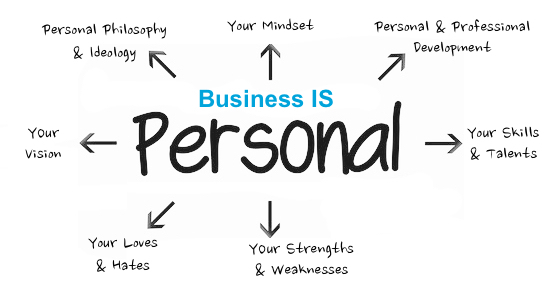 Being cognizant of this phrase, I have come to realize that many times business matters shouldn't be taken personal. After all business is only business. Or is it? Not taking things personal can be quite difficult in some situations. Especially when it's your business and other people are involved ─ which has become one of the most important lessons I’ve learned so far in my career. Being an entrepreneur, you tend to experience the ups and downs of going into business for yourself. I’ve heard stories from various colleagues and their experiences of how oftentimes individuals with whom they have hired are far more than just business associates. I myself have brought people on board to work for Hope, where previously, these individuals and I began as being really as good friends. Just as with my counterparts, they shared a common vision for the future of my business, thus a business professional relationship ensued. As in any business, problems and challenges are to be expected, especially when it's a startup company. In which case they are pretty much guaranteed. However leaping over these hurdles often strengthens the bond between entrepreneurs that have a shared vision and strive for a common goal ─ the success of their business venture! But what happens when those relationships deteriorates? What if personalities begin to clash or if visions begin to grow apart. There may come a point where it would be in the best interest for all parties concerned to end their business relationship. When faced with situations like these, the words "don't take it personal” tend to fall short. I absolutely agree 100 percent that when it comes to entrepreneurs, there is almost nothing more personal than their business, and I speak from experience. We have sacrificed greatly for our businesses to succeed. And it is he or she that has made the business what it is today. Think of successful business persons like Bill Gates, Jack Welch and Steve Jobs, and ask yourself, would these individuals have ever achieved their current levels of success without taking their businesses personal? I say, it is their business to take personal! Look around you for examples that are a bit closer to home. Almost everyone knows an example of a corner store, their favorite ice-cream parlor or bakery that sets itself apart because of the owner who is running it. That owner makes a difference because he or she takes their business personal. Whether you're dealing with business partners, employees, customers or other stakeholders. If you are in business, especially your own business, there will be times when you will have to make unpopular decisions. You may have to do things that you would rather not do. Nevertheless when it's necessary, it's necessary. Don't worry about letting if affect you every once and a while. Some things ought to be taken personal ─ just don't take it too personal. Connect with Angelia White on Twitter @angelialwhite Learn more about products and services at Hope For Women Magazine.